Reason For Reading: It's Sophie Kinsella, nuf said. Love Triangle/Insta Love/Obsession? : Tad insta love, but not crazy. Best Part: Glamping, Farmer Mike, and getting revenge on the mean girls! Worst Part: The ending was too quick! Thoughts Had: Oh i want to live in London, but in a yurt. 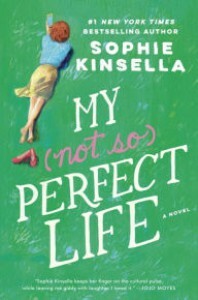 Short Review: Sophie Kinsella almost never lets me down. I'm actually thinking about rereading the Shopaholic series next month. I really liked the MC Katie, Cat i didn't like so much. I just wanted Demeter to be knocked down some pegs real quick, but later on, not so much. The whole "romance" bit thou, not believable to me, yah they f**ked a few times, but it felt so much more like a fling then what it turned out to be. The ending was too quick for my liking, the building up was so great and the details were there, but then it was like 15pgs of ending, like this book is huge, you could have given more to that other than just (view spoiler) Overall a good book by one of my fav authors. Book Boyfriend: None, the guy she falls for is too nonchalant for my liking.